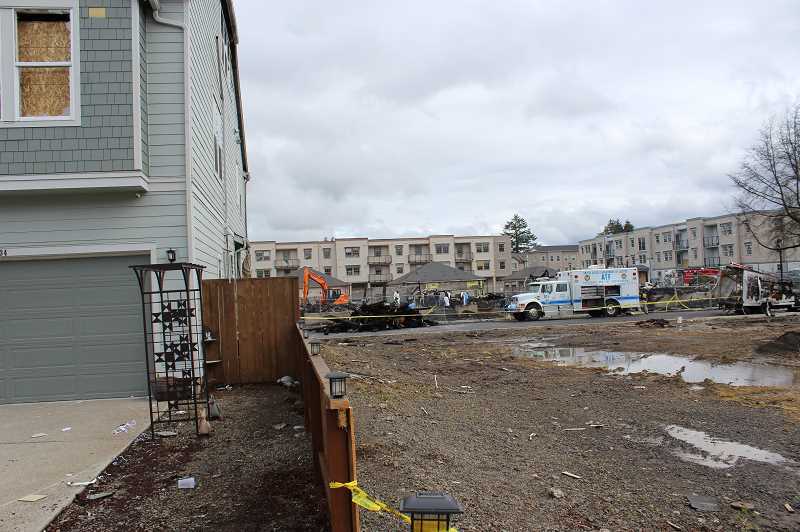 Community members also said the completion of the 34-unit Polygon Homes apartment complex that burst into flames Sunday, March 31, would only add to the congestion problem. "I think there needs to be consideration of what we're putting in our community," said Tamara Lukes, whose home was destroyed by the fire. "Putting a building of that size in again is going to clog up our streets even worse than they are clogged up." "The congestion is a big, big, big, big issue here. You cannot have a million cars in a community like that because it impedes the functioning efforts of the fire department and the police department, said Michael Bell, whose home was destroyed by the fire. "This is what took our home away from us, displaced us." Villebois resident Jason Downs suggested the City place a building moratorium on the community until congestion issues are addressed while Rectenwald said the community should have more stringent off-street parking requirements for developments. "Lack of parking is most definitely a safety and security issue. Stop placing developer profits above the lives of city residents," he said. The City shelved a work session item originally on the council agenda about the potential of implementing a vertical housing tax abatement program in the Villebois Village Center designed to incentivize retail development, which has languished for the most part. The plan would call for a partial property tax exemption at three undeveloped lots in the center and the development of buildings with a retail ground floor and three floors above for housing. West said the program currently does not sit well with him, and community members at the meeting also criticized the idea. "I think giving tax abatements to developments feels a little bit greedy right now and a little bit wrong," he said. "I'd like to see us look at different options and avenues." West, a Villebois resident and the most density-averse councilor, hoped the City could come to an agreement to address citizens' concerns. "I think there's some common ground we're going to have to find. I see new people getting engaged in government and that will affect outcomes. I think there's new people engaging in this process and that's an amazing thing," West said. "I also have great people on the council, and we all have the same goal of what's best for the community. I don't want it to be us versus them. I want to be collaborative." Wilsonville Mayor Tim Knapp told the Spokesman that he was opposed to the idea of immediately replanning the community — which went through an extensive master-planning process before development — but said he was open to discussing the Villebois residents' concerns at some point. "We'll have to have this discussion further down the line," he said. "There's a lot of information we've drawn on for Villebois design, and it's a thing many of the people newer in Villebois probably had not been a part of." mal amount of density in Villebois. "The density level that exists in Villebois is not unusual at all in communities across the country," Knapp said. "It's, in fact, part of the basis for the social continuity of Villebois, which is the fact that people interact with each other and have day to day contact with people because they are nearby." Rep. Courtney Neron, D-Wilsonville, who lives in Villebois, mentioned to the Spokesman that increased housing density in the Portland metro area has been used as a solution to the problem of housing scarcity and rising costs. "In terms of the density of housing, we know we have a lack of housing and it's a matter of doing it right," she said.